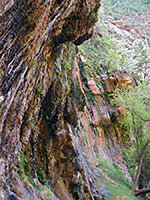 Along with Emerald Pools and the Gateway to the Narrows, Weeping Rock is one of the top attractions of Zion Canyon, and may be reached by a gentle, paved, quarter mile trail. 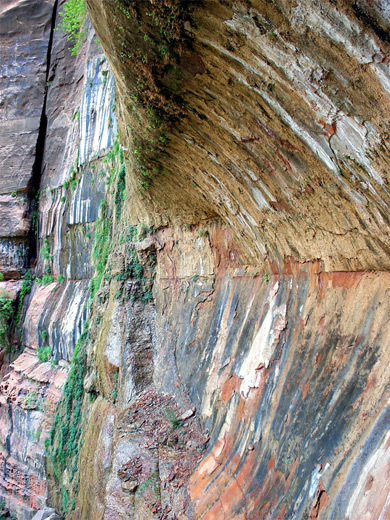 The rock is an eroded, bowl-shaped cliff face where water seeps out from the junction between two different sandstone strata (the Navajo and Kayenta layers) creating a year-round spring that nourishes hanging gardens of moss, ferns, grass and wildflowers. 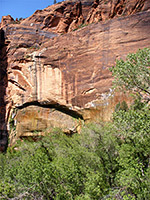 Such features are quite common in Zion, and indeed all across the Southwest's canyonlands, but this one is notable for being large and easily reached. The water collects to form a small, tree-lined stream that trickles down the hillside for a short distance before joining the Virgin River as it flows around Big Bend, beneath Angels Landing. Trail map for Zion Canyon. The approach road (Zion Canyon scenic drive) is open to private vehicles in winter, but between March and October Weeping Rock may be only reached by walking or cycling the 4.5 miles from Canyon Junction, or by taking the free park shuttlebus - stop number 6 if starting from the visitor center. The short trail crosses the stream on a footbridge then follows the creek uphill past bushes and cottonwood trees to the base of the rock, a cool, sheltered place kept permanently moist owing to the dripping waters from above. Although paved, the trail is too steep and uneven for wheelchairs. The path ends with some slippery steps and a walled viewpoint, which as well as the springs has nice vistas over the surrounding cliffs, including Great White Throne and The Organ. 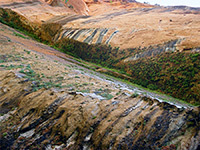 The rocks around the alcove have attractive, streaked patterns created by algae growing in bands where the water seeps down. In rainy times a large waterfall cascades over the cliffs, originating from Echo Canyon high above; otherwise the trickling waters result from very slow seepage through the thick sandstone, a process estimated to take around one thousand years. It only takes 5 to 10 minutes to walk to the rock, and there is not much to do when there, but for longer trips in this area the East Rim Trail also starts at the footbridge, leading to such places as Echo Canyon, Observation Point and Hidden Canyon.